Polish Amor ♥: My first post..... You Belong To Me!! My first post..... You Belong To Me!! So here we go... my very first post!!! I am in no means a nail polish expert... I dont know all the cool trends or how to even apply nail polish properly. Mmmm how did I get here... I was searching online for something I cant even remember what it was at this point... & I ran into some blogs! I liked what I saw and after a few weeks I decided to join. Maybe I can keep feeding my lil addiction and learn about new trends and techniques. Should all be fun!! All and All I'm just another girl who loves nail polish!!!! So for my first post... 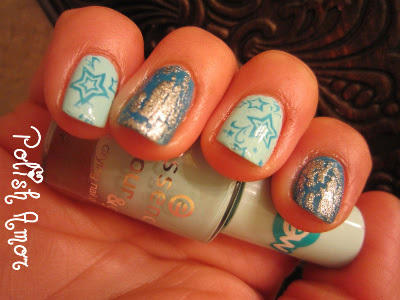 I'm testing out some Essence nail polish I picked up over the weekend, this is what I came up with. Im still learning to apply nail polish the "right" way I guess...eventually I'll get better. I'm also looking for a better top coat to make my nails shiny, so we will see what I can find. Great Haul for my pocket!!! !